FINANCE minister Mthuli Ncube’s engagement with market players to explore options for restructuring the Treasury Bills (TBs) to longer tenure — effectively rollovers of maturities — and surging inflationary pressures will leave banks exposed as this raises the spectre of defaulting and increases the risk profile of government’s short-term investment paper. Ncube announced in his budget statement last week that government would be engaging banks to increase the tenure of TBs to delay maturities to control money supply growth, one of the issues, together with the fiscal deficit and current account deficit, as well as inflation, which he said needed to be tackled to ensure macro-economic stability before currency reforms. Ncube’s budget was basically about advancing his Transitional Stabilisation Programme to stabilise the economy by targeting the fiscal and current account deficits which have become major sources of overall economic vulnerabilities, including inflation surge, sharp rise in indebtedness, accumulation of arrears and foreign currency shortages. 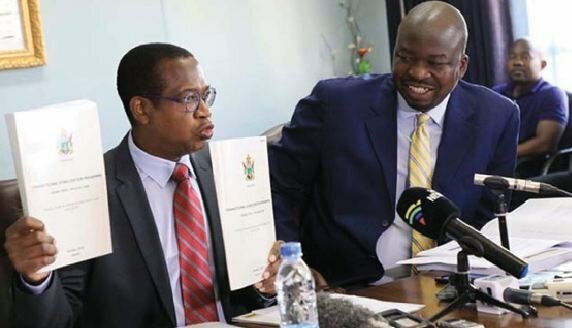 Ncube and his permanent secretary George Guvamatanga this week confirmed to editors during a luncheon in Harare that they were already talking to stakeholders to extend the TBs maturity tenures. “We are already talking to them,” Guvamatanga said, to which the minister added: “Yes, we are”. Ncube said there was no risk of default, but extended tenures to manage maturities in view of the US$2,2 billion required to fund the returns next year. Ncube said last week TB maturities of around US$2 billion next year were not sustainable, a suggestion he would seek to roll over the paper. Over the years, banks piled billions of dollars onto their books in government paper to meet regulations that compel them to have around 30% of their assets in liquid assets in the face of a credit crisis in the economy that saw the central bank creating a special purpose vehicle to mop up close to a billion dollars in non-performing loans, Zimbabwe Asset Management Corporation (Zamco). Ncube said he will now stop Zamco operations. As at June, a total US$4 billion TBs were taken by the country’s 17 financial institutions. CBZ Holdings, the country’s biggest bank by deposits and assets, accounted for the bulk of the paper in the market. Government securities and cash are classified as liquid assets. Zimbabwe’s annual inflation rate jumped to 20,85% in the month of October 2018 from 5,39% in September, while the return TBs is below 10%. Fixed-income securities often fail to outperform inflation because the interest rate on the investment is often locked. Ncube said inflation will come down once the budget deficit, current deficit and money supply growth are contained. A senior banker said Ncube’s move changes TBs’ yield curve and spreads. A TBs broking firm said Treasury’s action has shaken market confidence. Another banker said: “Banks will now start looking for non-core assets, which will be inflationary. As a bank treasurer I would not want to invest depositors’ funds in assets in which you are not sure of getting the returns when they are due.